This conversation took place as Julia and I crossed a parking lot to our favorite Chinese restaurant. Since it is the time of year when we tend to reflect on the last twelve months, I’ve been following orders and thinking about it—not so much what I’ve accomplished, but what I’ve learned. In January, I was a guy who ran a few times a week and thought completing a marathon would be cool. (And because I ran that first 26.2 in Phoenix, I can say, “Oh yeah, I’ve run with Josh Cox!”) Now, I’m a runner, pursuing my hobby with as much passion as I do my profession. I’m aware of this shift, this result of at least three insights collected on the journey. Running is an exercise in self-discipline. Sure, this includes getting up and getting out there, but it reaches beyond donning technical fabric and task-specific shoes.Honestly, just about anyone can muster that much self-discipline. Stretching to achieve goals, however, requires sustained attention. Training gives every run a purpose, and how I run needs to match the run’s intent. I’m learning that I need to attend to more than distance. Pace matters. Form matters. Nutrition matters. Even what I do on my non-running days matters. Thankfully, running also strengthens my self-discipline. Research suggests this is more than an insight. Fitness contributes several cognitive benefits, including greater self-regulation ability. When I’m forced to miss runs due to injury or a travel schedule, I can tell. My emotions lie closer to the border of irritation than contentment, and my concentration abilities suffer. I runas much for my mental health as my physical health (which really is a false dichotomy since we have embodied brains). No substitutes exist for a good “fan” and a good guide. A card that sits on my desk reads, “Your art and my art go hand in hand.” Behind the words lie a series of photographs. 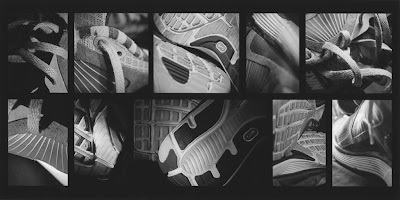 Close-ups, from various angles, of my running shoes. My “fan,” is a photographer, one whose support makes the occasional craziness of running possible. When I need three hours (or more) on a Saturday morning for a long run, my wife encourages me and asks, “How was your run?” when I return home. When I suggest running a race that requires travel, Julia investigates potential, photo-worthy subjects in the area. And she’s always there, at the finish line, camera in hand, chronicling and cheering my efforts. A good fan can be the infrastructure of goal achievement. good guide takes you places you weren’t sure you could go, never doubting your potential to get there. I know many runners who find the go-it-alone approach works for them, but I’ve experienced the benefit of having an expert focus on my goals and training. Though I began working with a coach out of frustration, I now find this collaboration contributes to the joy of running. Many think the main benefit is accountability. Sure, it’s good to have someone watching over your shoulder, but this is a rather negative perspective of a positive partnership. 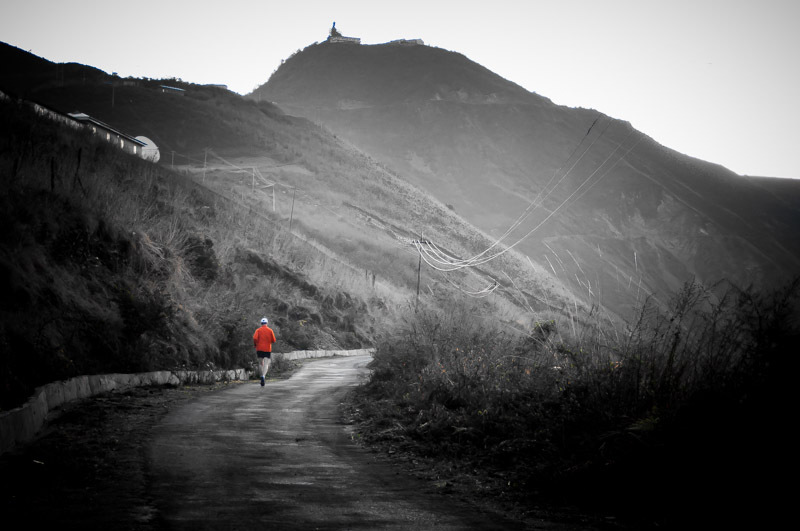 A good coach invests in a runner—invests time, energy, expertise, and ongoing strategizing. Training is more about continual adjustment and refinement than rigid plans, and an effective coach helps a runner make the necessary tweeks. I know, without an iota of doubt, that I am a better, stronger, and more passionate runner because of the investment my coach has made.One of the most re-tweeted posts I’ve contributed to the Twitterverse reads, “There may be nothing more powerful that you can give another than your belief in his potential.” A “fan” and a guide—believers you need on your side. Nothing, absolutely nothing, compares to the feeling of achieving a goal. I wrote previously about my ping-ponging emotions as I crossed the finish line of my second 26.2, the ING Hartford Marathon. Crossing the finish line is not the sole source of these emotions. It’s more the recognition and appreciation of the work it took to get to that finish line, the work that took place before race day. I’ll never forget my wife finding me in the finish area and asking, “Was it worth it, all those early mornings?” No hesitation. “Yes!” Working for something and seeing it happen changes you. Even though my major running achievement puts me squarely in the average bracket of marathon runners (3:55), it still required a price, and it still paid rewards. One reason I’m still running and chasing goals is to experience it all again. I frequently say, “I’m fine if such-and-such running goal is beyond my reach, but I don’t want the regret of having not tried.” I’m still learning, still growing, still striving to discover my potential. And this process is exhilarating. Yesterday, UPS delivered a new pair of running shoes. My usual shoes lay beneath the orange lid. Nothing new. Same brand, same model, same size. I ordered the same color I had a pair ago, so I already knew exactly what the shoes looked like. Still, I opened the box, thinking, “We’re a long way from Phoenix. Hope you’re ready for what’s next.” I’m not sure it was the shoes that I was talking to.